And so here we are, eleven years after the decision to hand the keys to one of London’s oldest theatres to one of Hollywood’s most complex faces, Kevin Spacey stars in, what one presumes, is his final turn on the Old Vic stage. Bringing in an actor to run a major theatre is a wonderfully archaic notion in the cut and thrust of West End economics, but Spacey has stayed the course and quietly become an integral part of the London theatre scene. He has helped bring grandeur back to the theatre and can surely take some credit for the current golden age of performance in the West End (even if writing and directing often remains troublingly conservative). Clarence Darrow is the curtain call that Spacey richly deserves. The reviews have been predictably close to hagiography for a performance piece that feels every bit of its 45 years old. Critics are studiously not reviewing the play but instead reviewing the performance. The audience rose as one to acclaim him, over 90% giving a standing ovation both for this role and as a thank you for the last decade. And indeed why not? This is a moment to loosen the tie, unbutton the shirt and just relax into the company of one of the most charismatic actors to grace the stage. There are very few actors on either side of the Atlantic who I would rather spend 90 minutes in the company of. Even from up in the gods and with almost half of the stage out of sight (although this is not the time to unleash my opinions on the Old Vic’s definition of ‘restricted view) the charisma of the man intoxicates. Spacey has maintained a visual presence outside of the theatre and Frank Underwood may become his defining role – and one cannot imagine anyone more perfect for the part – but his career has always been marked by the ability to create gloriously ambiguous characters that blur the lines of moral judgement. While his Richard III may not have been technically perfect it was a gloriously enjoyable performance, the theatrical equivalent of going to see the latest summer blockbuster. With Spacey as Richard it was not hard to see how this crippled hunchback would have so little problem with Lady Anne despite the difficulties of “was ever woman in this humour wooed?” The potency of Spacey’s Richard was more than enough to make us detest and admire him in equal measure. He is the kind of actor who has the self-confidence to disappear entirely into the role. So often we see a performance but with Spacey we always see the person. He acts without it being entirely clear that he is doing so, and by so inhabiting the part that there is no space left for the actor. 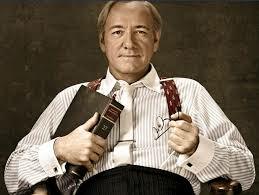 You could pick any of his roles but perhaps it is in Glengarry Glen Ross, American Beauty and, of course, as Verbal Kint in The Usual Suspects that we see Spacey giving us real people – actual beings, bringing the darkness and the light together – rather than just characters. The figure of Clarence Darrow is the perfect sign-off role; at a glance his impeccably liberal views may make him seen a rather anodyne figure but Darrow is essentially a small-town boy turned big-city lawyer in Chicago and no-one does that at the turn of the 20th century without a confidence that is born out of one part ferocious intelligence, one part moral purpose and about five parts barn-storming hucksterism. This is perfect Spacey territory, a role where he can turn the wattage up to maximum and become the bristling old general, reliving the campaigns from his armchair, holding rapt recruits in the palm of his hand with tales of adventures long-past. We, the audience, sit at his feet, as greenhorns hanging on to every word and Spacey wrings the maximum out of us. 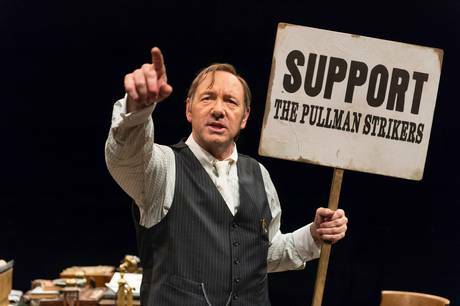 In a lively production, which some could accuse of being a little fidgety, Spacey shows himself at home in the round; he is an immaculate performer, the perfect trial lawyer, able to engage both the whole and the individual in the same move. It is a bold staging decision by Thea Sharrock and requires great confidence in your actor, in that they must be able to hold the attention despite continually facing away from at least some of your paying guests. However Sharrock has Spacey continually break the fourth wall and engage directly with the audience, as if they themselves were jurors, and these moments help to maintain the momentum. Importantly it allows the fiery energy of the performance bounce off another character, and lets the audience see through their eyes the righteous indignation of Darrow. One senses that Spacey finds him a kindred spirit. Darrow is clearly a natural performer and I found myself wondering how many of the lines were his own; the final impassioned plea against the death penalty must surely be one and so, one hopes, is the best line of the play; “they were more interested in building bigger and better prisons, rather than bigger and better men”. It is dynamite stuff, and when it is uttered out of Spacey’s mouth it becomes the cry of moral indignation that no man could refuse. Spacey is Darrow. It is a big, warm-hearted but never saccharine performance of a man who deserves to be lauded in this country as much of his own. In Britain there is little tradition of this kind of one-man show and it can take a while to feel your way into, but by the end you are marching with Darrow every step of the way. There are flaws with the production, and certainly with the play, however there is not one single flaw in the performance. And that is all anyone lucky enough to be in the Old Vic will care about.